Surely you have a lot to share on how you “survived” your first skiing experience, an unforgettable event that is full of hap-hazard incidents and challenges. To help you to record these beautiful and perhaps scary moments and show proof of your achievements, Liquid Image’s new camera and video equipped ski goggle will be an ideal gadget for you. The hands free and clipped on new Summit Series Snow Camera Goggle 335 from Liquid Image is easy to operate and user-friendly. Designed particularly for adventurers to capture their stunts in action while wearing gloves, the Summit Snow Camera Goggle has large buttons on the right for easy maneuvering. Users only need to turn on the device, choose the camera or video mode, and press the shutter button. 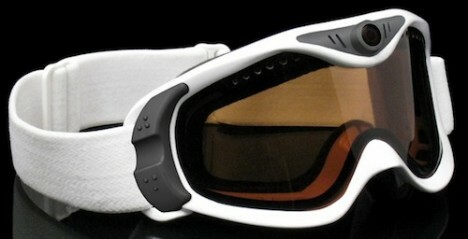 The camera goggle has a wide angle lens to capture all the action in skiing, snowmobiling, sledding or snowboarding. The camera has 16MB internal memory which can be further expanded by adding a Micro SD/SDHC card. Operating on an internal rechargeable Lithium Battery, the Summit Series Snow Camera Goggle 335 Camera is able to take 2200 still images or 2:20 hrs of video on a full charge. For a mere $149.00, skii enthusiasts can record all their priceless memories and show off their adventures (or misadventures) with this device.